August 10, 2017 – Property developer Cenang Resort Sdn Bhd (“Cenang Resort”) today announced its strategic partnership with Wanda Hotels & Resorts, a world-renowned hotel management company that will manage Wanda Realm Resort Langkawi within the resort-themed development of Tropicana Cenang. Strategically located in one of the most vibrant areas of Langkawi along the pristine beach of Pantai Cenang, the mixed development has a projected total gross development value (“GDV”) of RM1.55 billion. Through the strategic partnership, both Cenang Resort and Wanda Hotels & Resorts will spearhead new directions in resort management given Wanda Hotels & Resorts’ extensive experience in providing high-quality, international standard hotel management that will further boost the attractiveness of this mixed development, comprising a hotel, two 40-storey residential towers and commercial components tailored for the tourism and services industry. Earmarked to be an iconic addition to the Langkawi skyline upon completion by the end of 2023, this development which is located on 5.28 acres of prime freehold land fronting the Andaman Sea is expected to be a key tourist destination as well as family hub for leisure and entertainment, catering to both local and overseas tourists. “The development is expected to bring growth opportunities to both the tourism and property industry at this island. Tourism has emerged as a powerful vehicle for economic transformation, job creation and infrastructure development in Langkawi. A main tourist destination and the third largest island in Malaysia, Langkawi has emerged as an attractive option for property development and property investment. Given this positive outlook, we believe that this development will further spur socio-economic development of the local communities with the creation of more employment as well as entrepreneurial opportunities,” said Yang Amat Berhormat Dato’ Seri DiRaja Ahmad Bashah Md Hanipah, Menteri Besar of Kedah. The strategic agreement was signed between Yang Berbahagia Dato’ Wira Abdullah Hasnan Kamaruddin, Chairman of Cenang Resort, and Ilja Peopper, Vice President of Wanda Hotels & Resorts. The exchange of documents was witnessed by the Menteri Besar of Kedah, Yang Amat Berhormat Dato’ Seri DiRaja Ahmad Bashah Md Hanipah, Yang Teramat Mulia Dato Tunku Shazuddin bin Dato Seri DiRaja Tan Sri Tunku Sallehuddin, and Yang Berhormat Dato’ Paduka Haji Bakar bin Din, Kedah State Secretary. Cenang Resort also announced a separate strategic partnership with Sino Great Wall Co Ltd who will act as contractor of the seafront mixed development. Meanwhile, the new 7,531 square feet Property Gallery will showcase the various components of the development as well as serve as a one-stop centre for customer queries. Located on the development site, it will also house a lifestyle cafe, open to the public and interested customers visiting future show units. “We believe that this development meets the needs for high-end, seafront resort-living lifestyle, one that is tailored to further boost the tourism and services industry here. We are proud to collaborate with Wanda Hotels & Resorts, a company with a strong history of managing world-class hotels and resorts. Together, we hope that this project will not only meet the demands and requirements of luxury tourism on the island but also raise the standards of the facilities and services offered,” said Yang Berbahagia Dato’ Wira Abdullah Hasnan Kamaruddin, Chairman of Cenang Resort. The jewel of this development is Wanda Realm Resort Langkawi which is also the first Wanda Realm brand oversea. As a fast-growing premium hotel brand, Wanda Realm aims to provide quality service with the highest international standards for savvy business travellers and vacationers. Wanda Realm Resort Langkawi offers luxurious seafront resort experience with 350 hotel rooms, restaurants, conference, entertainment as well as fitness facilities. In fact, the management of the hotel will be done according to the guidelines stated in the Langkawi Local Planning Blueprint 2020, which focuses on delivering spacious rooms, quality infrastructure and enhancements. On the matter of the two residential towers, Tower A is expected to be completed by the end of 2021 while Tower B at the end of 2022. With a GDV of RM1.2 billion, the 1,102 fully furnished units of serviced residences offer three design options with scenic views — two, three and four — bedroom units with built-up areas ranging from 771 to 1,294 square feet. This upscale development will meet the needs of different market segments with the two-bedroom units ideal for young couples or small families and three and four-bedroom units for larger families. Meanwhile, its commercial component with a GDV of RM49 million offers a total of 16 units with built-up areas ranging from 479 to 1,453 square feet. The retail units are expected to be completed by the end of 2022. The property gallery will be open to the public starting on 9 August 2017, from Monday to Sunday at 9.30 am to 6.30 pm. For more information about Tropicana Cenang, Langkawi, please visit www.tropicanacenang.com.my. Cenang Resort is a property investment and developer established in 2012. Founded in 2012, Wanda Hotels & Resorts endeavours to become a respected international luxury hotel company from China. This vision has been achieved through three business models of hotel owner, owner and operator, and management contracts based on its core values of “People are our business. We hold the highest conduct. We seek mutual growth and success.” and corporate belief of “A greater goodness in life is achieved by treating each other with great respect and sincerity”. 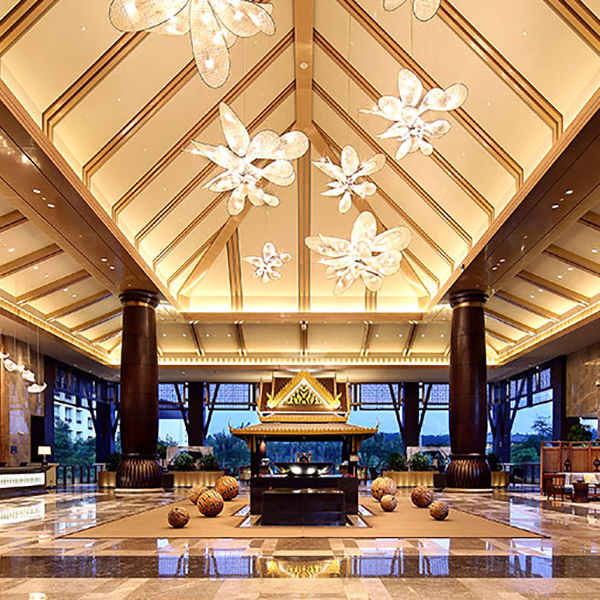 Wanda Hotels & Resorts manages four brands under its portfolio: the ultra-luxury brand Wanda Reign, luxury brand Wanda Vista, premium brand Wanda Realm, and select-service hotel brand Wanda Jin, all of which are dedicated to providing profound Chinese-inspired experiences and attentive services to travellers worldwide. By the end of 2020, Wanda Hotels & Resorts will own and manage over 100 hotels around the world, including Wanda Vista Hotels in Istanbul, London, Los Angeles, Chicago, Sydney and the Gold Coast. For more information or bookings, please visit http://www.wandahotels.com.